Fresh and simple made soup from potatoes. 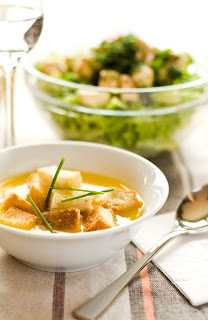 Croutons and lemon pieces add a zest to the soup, but when you subjoin a yoghurt you will make it perfectly tasty. 1. Chop the onion and the carrot and stew them with vegetable oil. Add water and boil the vegetables. 2. Peel and chop on cubes potatoes, boil them for about half an hour. Add salt and boil for 10 more minutes. 3. Strain all cooked ingredients and serve with chopped lemon pieces, finely chopped parsley and croutons. You can also add tablespoon of yoghurt or sour cream.